A technician installs a camera system in 1964 to capture the thorough test run in a simulated space environment. 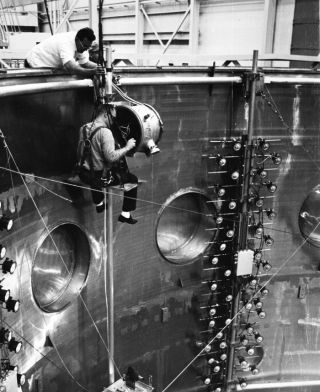 In this historical photo from the U.S. space agency, taken in 1964, a Goddard Space Flight Center photographer is assembling a camera system inside the dynamic test chamber at the Center's test and evaluation facilities. Thorough testing in facilities that simulate the space environment has become a hallmark at Goddard. After spending years on a single project, no scientist or engineer wants to lose a key instrument or an entire satellite because of a faulty component or electrical connection. As a result, developing thorough test and evaluation facilities and procedures has always remained a high priority.